This activity contains several parts, each of which is well-described and could stand alone or be combined with other activities. Educators can use all of the steps here or excerpt the parts that are most relevant to their situation. The activity includes a detailed list of teaching tips. 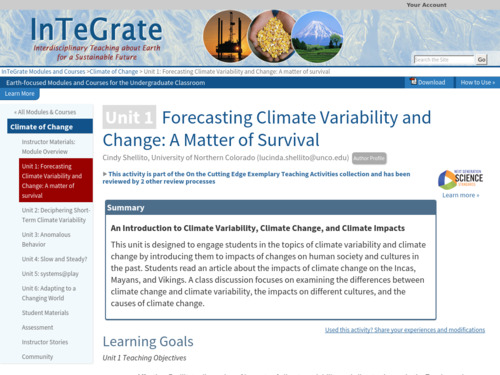 This unit is designed to engage students in the topics of climate variability and climate change by introducing them to impacts of changes on human society and cultures in the past. This is the opening unit for a module on climate change for introductory-level college students. This activity begins with a reading assignment that has embedded questions after each section. Students then take a reading comprehension quiz. Next, students further explore these topics via a gallery walk that allows students to rotate through different stations where they contribute ideas and input. During the gallery walk, students further explore the effects of climate change in these three locations, and they go on to examine positive and negative climate feedbacks. A guided class discussion helps reinforce the concepts. Questions to consider are provided to the students before the discussion so they have time to engage in higher-order thinking. A study guide provides vocabulary words, recall questions, and conceptual questions for students to review. Assessment methods are described, and an answer key is included. This activity is well thought out and carefully described. Each step of the process is thoroughly documented. Some of the files are restricted access for instructors only. Instructors can fill out a form to gain access. Those that have a SERC account and are members of NAGT will have automatic access.